Life should be lived in balance. That's why I love this time of year. With freshly picked apples in abundance and apple cider flowing freely you can feel the health coursing through your body. I balance that with my annual bag of candy corn, a taste treat that has no nutritional value whatsoever. Candy corn is pure food evil, but that's why it's so good and why it's essential to consume apples. Balance is the key here. One cancels out the other. CandyStore.com has identified the top candies. 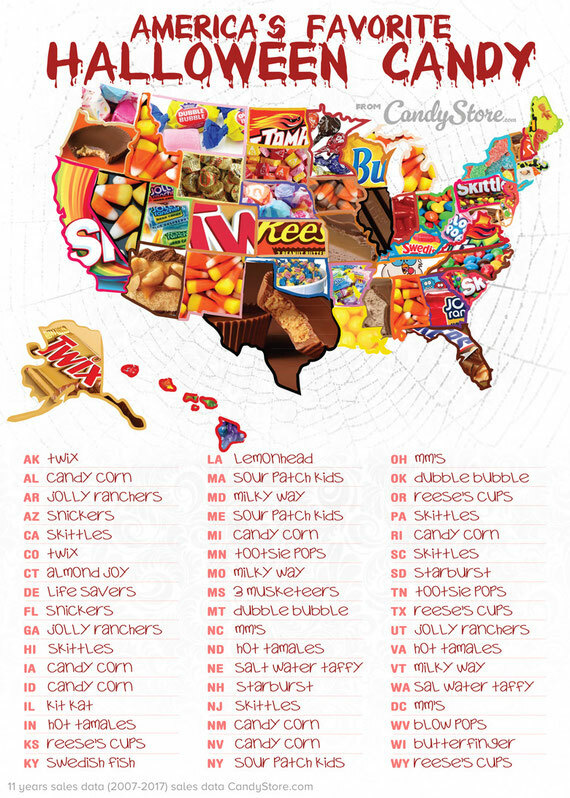 “We gathered eleven years of data and made a map of 2018's Most Popular Halloween Candy in America by state.” You can see the cool interactive map and a state-by-state listing at: https://www.candystore.com/blog/facts-trivia/halloween-candy-map-popular/. This time of year the kidlings might be thinking about a Halloween haul, but adults might be more interested in tailgating and football parties. A full report on the “Most Popular Game Day Snack in Every State” has been issued by WideOpenEats.com. You might start your game day with some pancakes (Arkansas) or Eggs Benedict (Kansas), then munch on some mozzarella sticks (California) or a Hawaiian cheese ball (pineapple, guava, coffee and nuts), have a baked chili cheese dog for the main course (Kentucky), and finish it all with a slice of pumpkin pie (Utah). Here in Michigan, you might substitute a big burger for that chili dog. “Michigan has a roster of restaurants famous for their burger game. Some version of meat on a bun is a must at a Michigan game day celebration.” A nifty game day snack graphic is at: https://www.wideopeneats.com/game-day-snacks-for-every-state/. The top ten death row requests are: an entire pizza, steak and baked potato, alcoholic beverage, hamburger/cheeseburger, milkshake, chicken wings, ice cream, mac and cheese, chocolate chip cookies and milk, filet mignon. Jim Neff is a local columnist. Read Neff Zone columns online at CadillacNews.com or NeffZone.com/cadillacnews.